The human race has an insatiable hunger for electricity. There are a number of different sources that supply our civilization with electricity from fossil fuels and nuclear reactors to renewable sustainable sources such as biofuels, hydro, solar, wind and geothermal. It would be best if we could obtain our electricity with minimum impact on the environment and human health. This pretty much rules out fossil fuels and nuclear fission power plants. Fusion power holds great promise but despite billions of dollars and decades, we have yet to demonstrate that it is even possible. Renewables hold great promise but there are problems with each source that have to be worked out in order to seriously expand their usage in the near future. There is future promise for a technically possible major energy source that will require enormous investment and overcoming a lot of challenges. This proposed power source consists of solar power collectors placed in orbit above the Earth which will beam energy in the form of microwaves or light to ground-based stations. This idea has been talked about since the early Seventies but we are finally entering an era of commercial space projects which might make it possible. This type of system is called space-based solar power or SBSP. With no atmosphere to block sunlight, the energy production would be higher than from solar collectors on Earth. The intensity of the unobstructed sunlight in orbit is about fifty percent higher than the best intensity ever found on Earth in ideal conditions. There would be no need to have a system to steer the collectors as the sun traversed the sky, or an omni-directional collection system. The sun would shine on the collectors twenty four hours a day throughout the year. There are significant challenges that would have to be overcome. Launching construction materials into orbit would be very expensive. It might be possible to lower the cost using material from the Moon or from an asteroid. The new construction system from Tethers Unlimited for creating huge orbital structures from spools of carbon fiber would be a big help in this undertaking. Panels in the collector would suffer degradation at about eight times the rate of collectors on Earth in the harsh conditions of space. Space debris could damage the collectors. 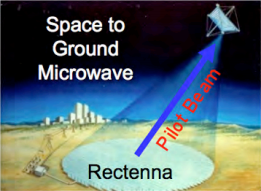 Using microwaves to transmit energy to the Earth rectennas could interfere with existing satellites. Converting the energy to microwaves and back to electricity would result in significant losses. Japan is working on SBSP. Japan passed the Basic Space Law in 2008 which singles out SBSP as a national priority. Japan is extremely poor in conventional power sources such as fossil fuels and uranium. The Japan Aerospace Exploration Agency has a "roadmap" for the development of SBSP. The China Academy for Space Technology (CAST) presented their "roadmap" for SBSP at the International Space Development Conference (ISDC). The Chinese roadmap called for a one gigawatt commercial power system by 2050. They showed a video and provided a detailed description of their proposed system. The U.S. Secretary of Defense, Secretary of State, and USAID Director sponsor the D3 (Diplomacy, Development, Defense) competition every year. A proposal for a SBSP system won several awards in 2015. There is currently a petition on Change.org calling for the U.S. to develop SBSP. If technical challenges can be overcome and funding can be secured, SBSP would be an excellent source of sustainable power with minimum environmental impact.